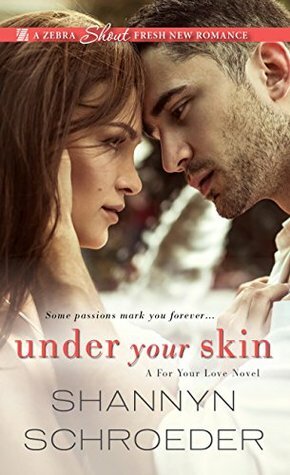 Under Your Skin was a very entertaining book. It’s a slight departure from the books that I usually read. The heroine is a 22-year-old named Norah O’Malley. She moves back home and surprises her family with the news that she is 6 months pregnant. She has 3 older brothers and a father who are all over protective and not happy about her situation. After her mother died when she was younger, Norah was sent away to live with her aunt so she wouldn’t be negatively influenced by her older brothers. That’s ironic to say the least. As Norah is trying to figure out her future, she ends up working for one of her brother’s bosses. His name is Kai Ellis and he owns the tattoo parlor where her brother works. Kai’s mom is recovering from surgery and Kai needs someone to look after her for a few months. Kai is a very complicated guy. He used to run with a gang and spent some time in jail. Now, he makes it a point to keep certain parts of his life separate from each other. Consequently, mixing business with pleasure is not his choice. He and Norah attempt to avoid their attraction for multiple reasons but eventually they give in to temptation. Norah’s pregnancy prompts Kai to pursue alternative ways to satisfy their sexual desires and that makes for some extremely hot interactions. Kai and Norah are good for each other. Unfortunately, Kai doesn’t think that he is worthy of someone like Norah. By the end of the book, they have both decided to make some drastic changes to their lives that you may not see coming. I couldn’t help but root for their happy ending. They both have gone through a lot and deserve to be happy and loved. The supporting cast played a huge role in how everything turns out. I especially liked Kai’s mother. I look forward to reading the next book in this series.